With preparations for the organic laws accompanying the constitution under way, it is becoming clear Thailand is heading towards a 'guarded democracy'. Since the draft constitution gained public approval in the Aug 7 referendum, discussions have now shifted towards the organic laws, in particular the one on political parties. There are grounds for concern that ongoing developments may not benefit the parties — at least not the large ones. Moves by those involved in shaping our parties seem to reflect the regime’s perception that politicians are to blame for all the nation’s problems, and that it is necessary to limit the participation of politicians in elections. But one fact should not be overlooked. Political parties in Thailand, unlike those in advanced democracies which have a chance to mature and adapt to changing public interests and problems, do not have a chance to thrive and mature. In the interchangeable periods between democracy, coup d’etats and authoritarian governments, parties’ development and the road to maturity have always been cut short. The longest party in existence is the Democrat Party, since 1946. Conservative in nature, they played the political game well. They were the core in forming seven governments and four of its party leaders became prime ministers. The more progressive ones were crushed. The nation’s first party was Khana Ratsadorn, or the People’s Party, which led the so-called 1932 Revolution that changed then-Siam from an absolute monarchy to a democracy with a constitutional monarchy. The radical reform agenda antagonised the royalists and conservatives. The first 25 years of Thai democracy was tumultuous, ending with military dictatorship. In 2001, the Thai Rak Thai Party under Thaksin Shinawatra won power with a progressive platform to address the nation’s economic plight. The party was able to assemble technocrats, academics, businessmen and political factions. It was pluralistic in composition, aided by the 1997 constitution that introduced the party list system. The government lasted the full four-year term and was re-elected with an absolute majority of MPs in parliament — the first time in Thai history. However, proposed changes upset the status quo and he eventually lost the support of the royalists and conservatives. The coup d’etat a decade ago overthrew his government. Political conflict has endured to this day. The ongoing conflict became an excuse for another coup in 2014 under the National Council for Peace and Order, which adheres to the idea of guarded democracy. The logic is the people are fooled by politicians’ propaganda. People are ignorant and not knowledgeable enough, and parties are just vehicles for politicians to seize power and abuse their positions through corruption. They must be contained. It is thus the duty of the intelligentsia, the technocrats and the military to protect the people, to lead and run the country. They are the “good” people, the knights on white horses who are the true saviours. First, the possibility the law may require members of parties to register or reapply and to pay a minimum fee, for instance 200 baht a year. The reasoning is that by putting everybody at the starting line, it will create a level playing field. 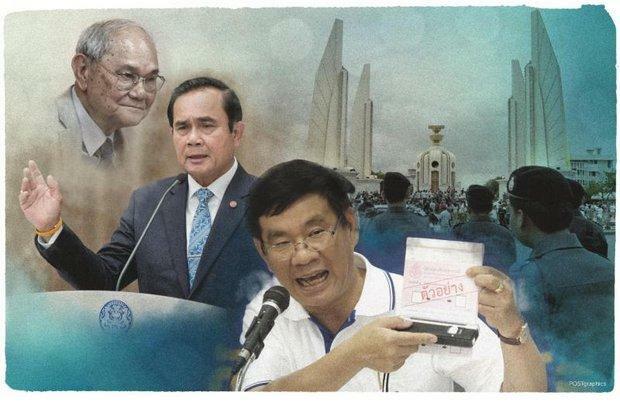 But the hidden agenda is to break up the main parties, especially the regime’s main opposition, the Pheu Thai Party. The re-registering move will free up factions within the party. Certain MPs or canvassers could break under the pressure from the military. Smaller and multiple parties weaken the political system. No one party would dominate, less gain a majority. A coalition government will be needed. A party with 10 MPs could bargain for a ministerial post. This will open the window of opportunity for an outsider and unelected person to become the arbitrator and prime minister. Second, parties will have little room to propose any new policies. Platforms must be in accordance with the constitution and the 20-year strategic plan being drafted under the mechanism set up by the military regime. What would be the use of an elected government controlled by technocrats? Who will be accountable to the people? Third and worse, the Election Commission (EC) wants the parties to send assumptions of proposed platforms to be used in a campaign for examination. The EC can then decide which platform is viable. But that is not the EC’s duty; it is the voters who should decide. There is a learning curve in democratic development. The public must learn what types of MPs they want to represent them and whether a party has proposed good or bad policies and whether they can keep their promises. Voters must be the judge of who makes the decisions to allocate taxpayers’ money and where that money should be spent. If anyone is going to monitor these policies and politicians, it should be the media. Fourth, there must be no more dissolution of parties. Such actions in the past only created more animosity and confrontation. The EC proposal said parties will not be disbanded except in the case that a party’s action has the intention of working against the Thai system of democracy with a constitutional monarchy. That makes no difference because it gives the Constitutional Court leeway to ban parties again, as was done in the past. Let parties rise and fall on their own, upon the public’s trust and distrust. A party is a public institution belonging to its members. If any politician or executive of a party abuses power or does something illegal, they must be charged. But the party must learn its lessons, explain itself and live on. Fifth, there are talks of trying to limit certain aspects of election campaigning. Parties might not be allowed to hold large rallies. Some are even trying to suggest candidates can only put up posters in EC-designated areas. But parties need to convey their beliefs through communicating with the electorate. Campaigns must be allowed — the more the better. We all have a duty to help citizens become ‘informed’ voters. Sixth, the concept of political parties organising American-style primaries, or seeking approval of party branches for candidates, which is the British way, are both interesting. However, either system must not be forced upon the country. This must be decided as an internal party matter and be developed at an appropriate time. Parties must win the public trust by letting members have full access to party proceedings, whatever they may be. If sovereign power belongs to the people, as written in the constitution, and all humans are equal, then the people must decide their own fate. Through democracy, pluralistic and representative, people elect their leaders and set agendas. Political parties are vehicles to achieve and ensure that the people’s concerns will be addressed. They must be stronger but be accountable for their actions.